Renee Howard, third-grade teacher at Congress Elementary in Grand Rapids, coaches her students on writing. To recap: Congress Elementary is a school that has had comparatively low test scores. Most of the kids come from families who have low incomes. Now, almost five months after the kids sat down to take their standardized MEAP test, the state has finally released the results. And Congress principal Bridget Cheney says she’s excited. "The most exciting thing for me is that across the board we increased in every single grade level, every subject area," Cheney said. "That’s the most exciting thing for me." MEAP growth at Congress Elementary over time. Some of the gains were pretty dramatic. For the third-grade class, which I followed for the six weeks leading up the MEAP, Congress went from having only 23 percent of kids scoring proficient to having about 56 percent of kids score proficient. That’s more than double the percentage in one year. 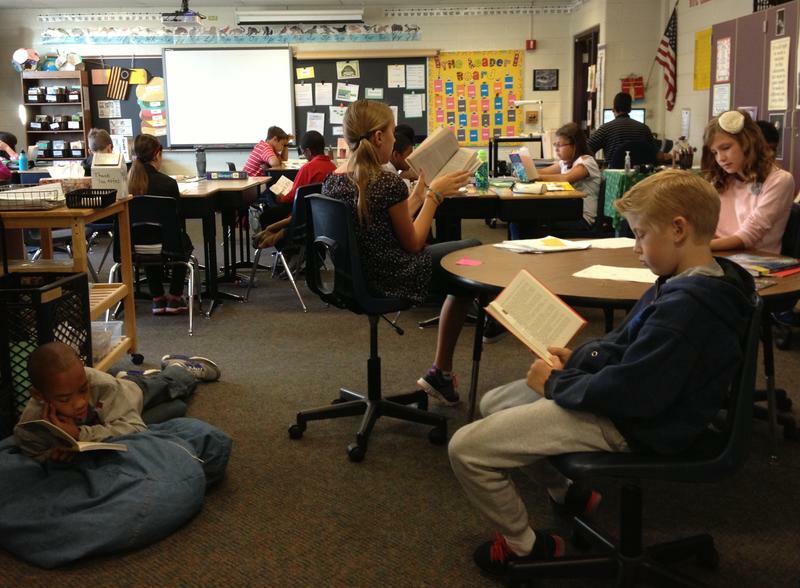 Part of the reason Congress Elementary has seen such growth in reading scores is because the school, like a lot of elementary schools in Michigan, has thrown resources at improving reading. Many of the kids at Congress received extra tutoring with reading, some of it from outside organizations, like the Schools of Hope Program. I sat in on one tutoring session with third graders Darius and Marquan in the week before the MEAP test. Both students first heard a sentence out loud, then wrote it down. "Okay, now look at your sentence, what do you need to make?" asked the tutor. "A comma," said Marquan. "And a period!" But not every subject area has the same support structure. "I feel like even though I'm doing science and it's good science, they're not ready for science MEAP," said Congress Elementary fifth-grade teacher Charity Fleming in October. "Math and reading have good MEAP prep behind them." said fifth-grade teacher Charity Fleming, during a teacher curriculum meeting at a round table inside the Congress Elementary library in early October. Fleming's students would take the MEAP the following week, and she was scrambling for materials to prepare them. "So I feel like even though I’m doing science and it’s good science, they’re not ready for science MEAP," Fleming said. "There hasn’t been the MEAP prep for science that there needs to be. And the packets that they gave me and said, 'here’s your MEAP prep, do this with them,' are completely unattainable to do in the amount of time that they wanted us to set it up and do it." Five months later, we can say Fleming’s concerns had validity. Only five percent of her kids were proficient on the science portion of the MEAP. But statewide the numbers aren’t a whole lot better. Science is consistently the worst subject for Michigan’s fifth graders, by a wide margin. In that sense, Congress is like many other schools. At the same time, Fleming was also right in October about how her students would do in both reading and math. Her class actually outperformed the state average in those subjects, which is even more impressive when you consider that most of her kids don’t have the same resources at home as the average Michigan kid. On the whole, Congress Elementary’s MEAP results still lag behind state averages. But the trend shows greater improvement at the school than for the state as a whole.